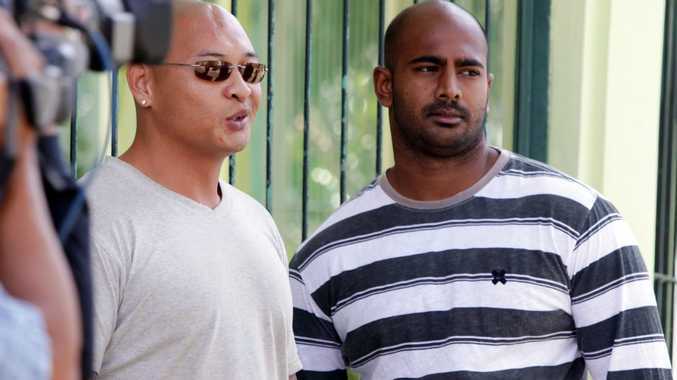 WITHOUT blindfolds and singing Amazing Grace Andrew Chan and Myuran Sukumaran marched to their deaths. The two convicted Australian drug smugglers, as well as the six others executed on Wednesday morning, refused offers of blindfolds and broke out into song as they waited to die. They were tied to crosses, their arms outstretched, before they were shot dead. According to media reports family members on Nusakambangan Island's opposite end could hear the gunshots. Before midnight on Tuesday night the Sukumaran and Chan families held a candlelit vigil as they watched the cars containing their condemned loved ones drive away. What's your reaction to the execution? This poll ended on 06 May 2015. I'm outraged and completely oppose the death penalty. These guys were reformed, they shouldn't have been killed. They knew the risks and must deal with the consequences. Heroin kills. I have no sympathy for them. One woman scheduled to be executed with the others, Filipino maid Mary Jane Veleso, was spared just hours earlier. Ms Veleso had fled the Philippines in 2010, escaping her poverty-stricken life, and was intercepted with 2.6kg of heroin lining her suitcase. She has always maintained she was duped into carrying the suitcase and she was spared execution when her recruiter Maria Kristina Sergio surrendered to Filipino police on Tuesday. Ms Veleso's execution was postponed after a request from Philippines President Benigno Aquino III. Her lawyer Ally Edre Olalia told media on Tuesday he believed her innocence would still be proved. "We believe that proving the human trafficking case in the Philippines will in effect prove her innocence," he said.